In 1985 my grandfather died. When reviewing his personal belongins we found out an old box somewhat smaller than a shoe box. Inside it and along with various papers, old photographs, yellowish newspaper clippings and some decorations, there was an old military watch. That watch had been my grandpa's war watch, an Army officer during the Spanish Civil War between 1936 and 1939. It was not a pilot's watch, since he had not been an aviator, but it was unmistakably a military watch. No one in the family had seen it until we opened the box. It had remained hidden for 50 years. He never put it on, as most likely his war memories were not pleasant and all he wanted was to forget what he had seen. Back In the mid-80s of the XXth there was no such thing as the incredible repository of information that is the Internet today, so finding information about the watch was not as easy as it is today. 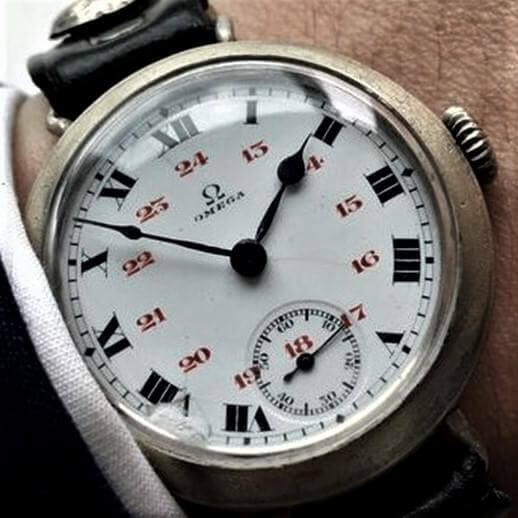 The brand was well known, and some watch and antique dealers found it pretty interesting and perhaps with some value both for the watch itself and for its historical value. In the 90s I restored the watch. Nowadays it is still working out perfectly and I only need to hand wind it when necessary. One day I went online to find out more about my device. It was pretty easy to find information about both the brand and the model. It was an old Swiss Made military watch from the 30s, an expensive watch at that time (and currently). It was not evidently an endowment watch for army personnel. It seemed more like a gift for someone going to war from a beloved one wishing him good luck. Perhaps his parents? Or perhaps my granny, his then soon-to-be wife? What this watch saw that he never wore after the war and remained kept in a box for 50 years? We will never know the answers to any of these questions. However, as a fan of watches since I was a young boy, since the very moment we found that watch in an old box I developed a special attraction for military watches and became an old pilot watches aficionado. Brands such as Zenith, IWC, Hanhart, Stowa, Laco, Hamilton, Denco, Buren, Doxa, Pierce, Grana, Askania, Alpina, Dogma, Revue, Helios, Junghans, Cyma, Silvana, Minerva, Wempe, Helbros, etc started to be part of my small watch collection achieved by negotiating with antique dealers, internet auctions or specialized websites. In 2017, an idea and an unexpected opportunity came up: designing and manufacturing quality watches at affordable prices remenbering those pilot watches from the golden age of aviation: the pioneers in the early years of XXth century, the First World War, the inter-war years, the Second World War, the 50s ... and making them not only inspired by the aviators, but also by other types of pilots: the gentlemen drivers pioneering in car racing since the early XXth century years until the 60s , or the crew on board boats or submarines. I also wanted to recreate the aesthetics of the Cold War era from the Soviet side, so mysterious for those of us who live in the West. So AËROLUFT was born. A brand with the designing, manufacturing, distributing and selling resources of XXIst century, but with the aesthetics and pioneering spirit of the first half of XXth century.